My brand new electric clothes dryer won’t heat up, yet everything else seems to work – Help! Recently I had a question from a site visitor regarding a problem with an electric dryer. They had moved into a new home with new appliances, including a brand new dryer. When they went to use it, however, they found that the electric dryer would cycle correctly, but not heat up to dry their clothes. They even took the dryer back and tried another one, and still experienced the same problem. This is a fairly common issue that can happen with a certain type and style of electrical panel and breakers. When installing slim-line style breakers into a Schneider (FPE, Sta-blok, etc.) 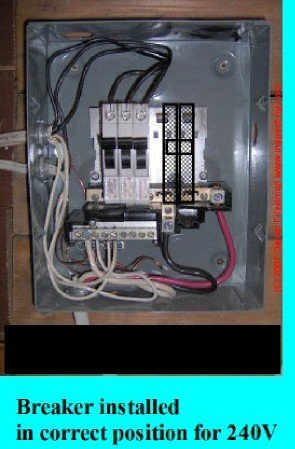 panel, you have to ensure that the breaker gets into the correct position in the panel. The breaker will fit just fine, but if it isn’t across the divider between hot buss bars, you will only have one side of the 120 volts on each of the load terminals. If the breaker is in positions 1,3…., down the left side of the panel, or 2,4…, on the right side, you will have this problem. It needs to be in position 3,5…, or 4,6… to correct the issue. To check if this is the problem you will need to use an electrical meter or tester. 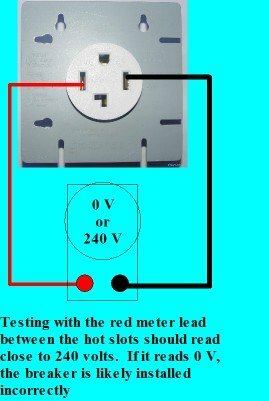 At the receptacle (30A, 125/250V), test from one of the hot wires to neutral or ground, and then test the other. Each should read somewhere close to 120V. Then test from one hot to the other hot. The reading will be 0 volts if the breaker is indeed installed incorrectly. 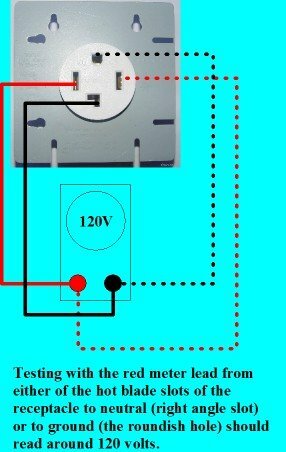 When the breaker is in the correct position you will have somewhere around 240 volts between the two hot wires. If not, the dryer won’t heat. The heating element uses 240V. The reason the controls, light, motor, etc. Continue to work is that these components use one side or the other of the 120V to neutral for a supply. I am using an actual picture of the inside of a small load center just to give you a clear picture of how this problem can occur. 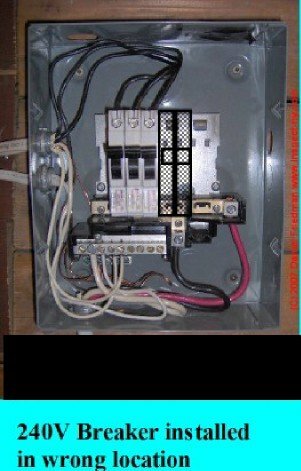 This is an issue that really presents no safety hazard, only that if the installer isn’t paying attention when using this type of breaker and panel, it can cause a lot of unnecessary grief. Hauling a dryer in and out of a home is enough of a job to do once, let alone two or more times. However, the most costly mistake of this nature that I’m aware of comes from my own experience. While working for a large oil company as a contractor, another installer made this mistake while connecting an electric heater for a small equipment shack, so the heater wasn’t working. That’s when they called me in to troubleshoot the problem. This wouldn’t be such a big deal, only that the equipment shack was for radio communication equipment, and was right on top of a Limestone Mountain in the Canadian Rockies. The only access to this site in the winter is via helicopter! While this provided me with a grand tour of the Rockies, with an exciting climb using 95% of the chopper’s power to the maximum height this machine can climb, and landing on a pad not much larger than the helicopter itself, it also provided the oil company with a rather large bill as you can imagine! So if this situation ever comes up again, an electrical meter or voltage tester, and knowing how to use it can save you a lot of time and effort in correcting the issue without trying several new dryers in the process. 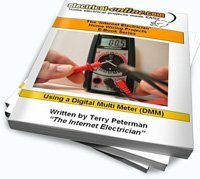 Do you need help understanding how to use and interpret a digital multi meter? Check out this helpful instructional e-book that explains this essential troubleshooting tool! Click here for more. I Need to add a Washer Outlet. This entry was posted in Troubleshooting, Wiring Common Home Appliances and tagged breaker, breaker panel, clothes dryer, dryer, electric dryer, FPE, hot buss bars, Schneider breaker, Sta-blok. Bookmark the permalink.